When constructing and managing their portfolios, all Canadian managers of global assets with foreign currency exposures must answer the question, "To hedge or not to hedge". Readers of this blog will have realized by now that we choose not to currency hedge the portfolios. That does not mean that we ignore currency movements: We sometimes tilt our portfolio in favour or against more foreign currency exposure. It means that we have adopted a strategic policy not to hedge foreign currency exposure because we believe that in Canadian dollar denominated portfolios such exposure provides diversification benefits that largely offset the additional currency risk. Over the past three years, adopting a no hedge strategy has been beneficial for Canadian investors in Global ETF portfolios, in terms of higher returns and with little or no increase in portfolio volatility. The chart below shows the growth of C$100 for the conventional 60/40 pension fund portfolio and for a Leveraged Risk Balanced portfolio. Returns are plotted for both the unhedged version and US dollar currency hedged version of each portfolio. These portfolios are constructed from the list of ETFs that we regularly monitor (see here). The ETFs for Canadian assets, such as the equity ETF (XIU), the long government Bond (XLB), corporate bond (XCB) and the Real return Bond (XRB) are denominated in Canadian dollars. The ETFs for US assets, such as the US equity ETF (SPY), the long government bond (TLH), and the inflation-linked bond (TIP) are denominated in US dollars. Commodity ETFs are also denominated in US dollars. The ETFs for non-US foreign assets, such as Eurozone equities (FEZ), non-US government bonds (BWX), Emerging Market equities (EEM), and Emerging Market local currency bonds (EMLC) are denominated in US dollars, but hold securities denominated in other currencies including the Euro, the Yen, a wide range of Emerging Market currencies. As a result, even though these ETFs are USD products, they do have exposure to a variety of other foreign currencies. The Hedged versions of the portfolios shown above assume that all of the foreign ETFs are US dollar hedged and therefore receive their US dollar return, while all of the Canadian ETFs receive their Canadian dollar return. The Unhedged versions of the portfolios assume that none of the foreign ETFs are hedged and therefore all ETFs receive a Canadian dollar return, which for the foreign ETFs will comprise the US dollar return plus the change of the US dollar versus the Canadian dollar. Comparing the two versions of the 60/40 portfolio, since the beginning of 2012, C$100 invested in the Unhedged version has grown to C$137.30 while the same C$100 invested in the Hedged version has grown to C$130.90. The Unhedged portfolio has had an annualized return of 11.6% over the period, compared with a 9.8% return for the Hedged version. This is not surprising as the US dollar has appreciated steadily over the period, so holding the ETFs in unhedged form in the portfolio has added returns. What is somewhat surprising, however, is that the volatility of the two portfolios has been almost identical. 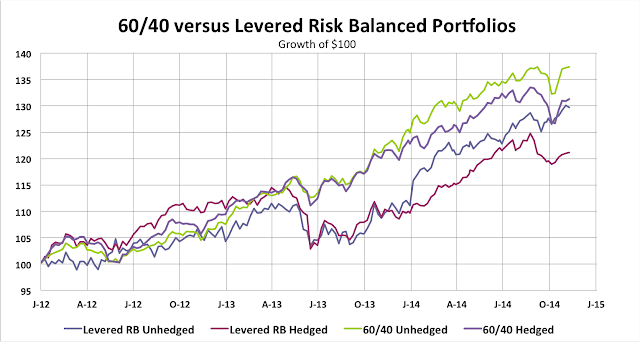 Comparing the two versions of the Leveraged Risk Balanced (RB) portfolio, since the beginning of 2012, C$100 invested in the Unhedged version has grown to C$129.70 while the same C$100 invested in the Hedged version grew to only C$121.10. The Unhedged portfolio has had an annualized return of 9.4% over the period, compared with a 6.8% return for the Hedged version. The Unhedged Levered RB portfolio was about 15% more volatile than the Hedged version of the same portfolio. Interestingly, the Unhedged Levered RB portfolio was 40% more volatile that the Unhedged 60/40 portfolio over the period. During the recent period of Canadian dollar weakness, the "No Hedging" policy has boosted returns significantly. 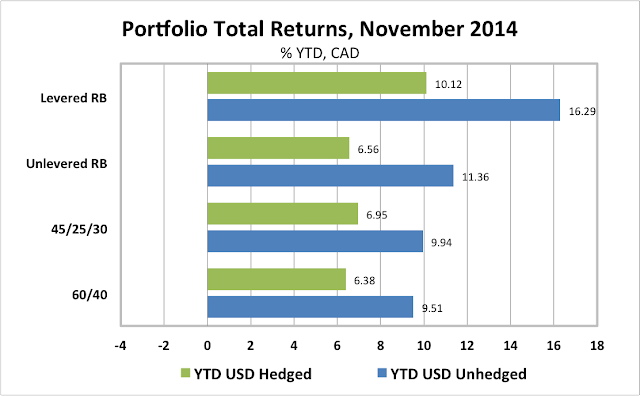 The chart below shows year-to-date returns in Canadian dollars for both the unhedged and the hedged versions of the four portfolios that we regularly track in this blog. In 2014, leaving the portfolios unhedged has added from 300 to over 600 basis points to portfolio year-to-date returns. The largest positive effect has been for the Levered Risk balanced portfolio, because a substantial portion of the leverage is used for US dollar denominated government bonds. The Unlevered RB portfolio also has a relatively higher allocation to foreign currency ETFs than do the 60/40 and 45/25/30 portfolios. In a future post, I will discuss the tactical adjustment to the Unhedged portfolios that may be taken to protect currency gains in the event that the Canadian dollar reverses course and begins to appreciate versus the US dollar.